OE-Mail Recovery 1.8.32 free download. OE-Mail Recovery is an application for repairing Outlook Express folders if they are damaged or corrupted. OE-Mail Recovery is an application for repairing Outlook Express folders if they are damaged or corrupted. OE-Mail Recovery (Outlook Express mail recovery tool) extracts and saves e-mails from .dbx files in which Microsoft Outlook Express stores messages and folders on the local drive. The program will help you avoid troubles with Outlook Express folders, fix the problems with Outlook Express folders that you can't open or recover .dbx of Outlook Express. OE-Mail Recovery helps you recover accidentally deleted messages from the Deleted Items folder in Outlook Express - undelete Outlook Express e-mails deleted from the Deleted Items folder. The software can recover deleted Outlook Express mail, but this is only additional function of the software. OE-Mail Recovery reads .dbx files and identifies e-Mails stored in them. The recovered messages can be viewed and saved as the message files in the .eml format. The recovered messages can be opened by Microsoft Outlook Express and easy moved/copied to its folders. The program has a wizard for easy Outlook Express Recovery. With the wizard's help you'll perform Outlook Express Recovery in 5 steps. No special knowledge is required to repair Outlook Express and recovery dbx files (recover .dbx). OE-Mail Recovery is like insurance for your Outlook Express Emails and Outlook Express recovery software. If, all of a sudden, you can't see any emails in an Outlook Express folder and it become necessary for you to repair Outlook Express, take advantage of OE-Mail Recovery (Outlook Express mail recovery tool). Outlook Express Inbox recovery tool is an easy-to-use Outlook Express repairing tool for recovering dbx file. The tool allow recover .dbx files of Outlook Exprees versions 5, 5.5, 6. 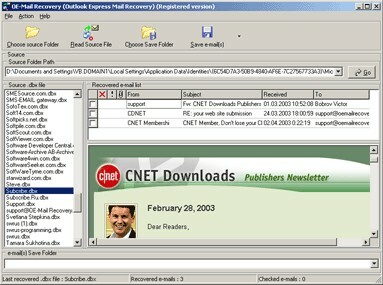 OE-Mail Recovery is Outlook Express mail software. Undelete accidentaly removed messages (Outlook Express undelete). Recover Outlook Express emails deleted from Deleted Items folder. e-Recovery for Outlook Express recovers deleted e-mail messages even after you have emptied your "deleted items" folder. Recover My Email for Outlook Express is a tool that recovers deleted or corrupted email messages even after you have emptied your "deleted items" folder. Stellar Phoenix Mailbox Standard is a tool for repairing Outlook Express email folders if they are damaged or corrupted. Kernel for Outlook Express recover emails from deleted, damaged, corrupt mailbox files. Advanced Outlook Express Recovery is a powerful application to recover deleted email from Outlook Express mail folders. R-Mail is Outlook Express mail recovery tool designed for undelete accidentally deleted e-mail messages and recovery damaged *. Easy Outlook Express Repair is an utility for restoring damaged folders in Outlook Express.